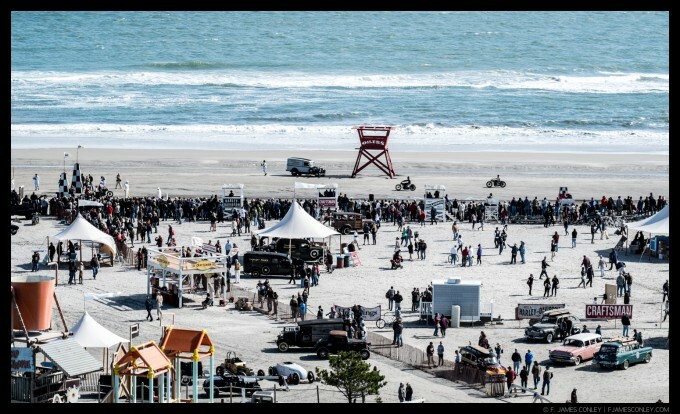 Every October, tattooed and heavily bearded men (and a few women) gather in Wildwood, New Jersey, and take over a section of the beach. With beer on tap, loud music, and louder motorcycles and cars, this motley crew waits for the tide to recede and then grinds up the sand racing antique vehicles down a quarter-mile. 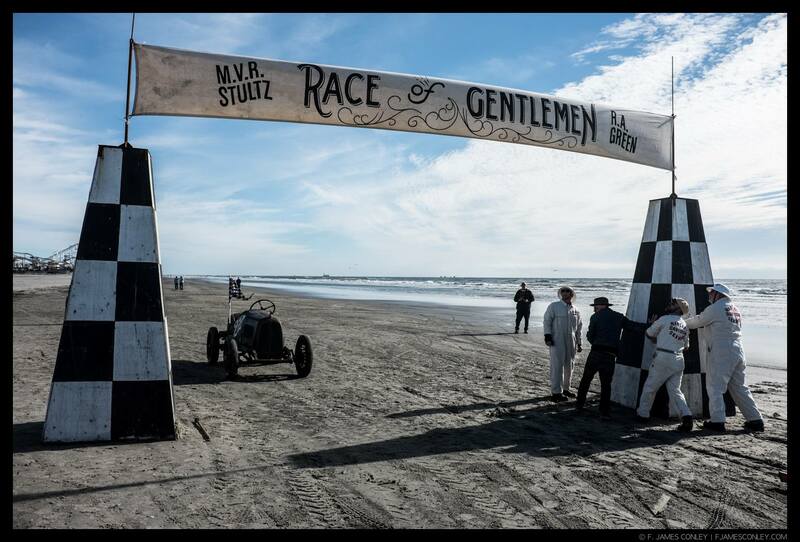 Known as The Race of Gentlemen, the event at first seems to be one of the most wrongly named. Since the event was a spectacle, and I didn’t have to worry about being discrete, I set out to observe the event with three cameras: a Fuji X100s, XE-1, and a Canon 70D. 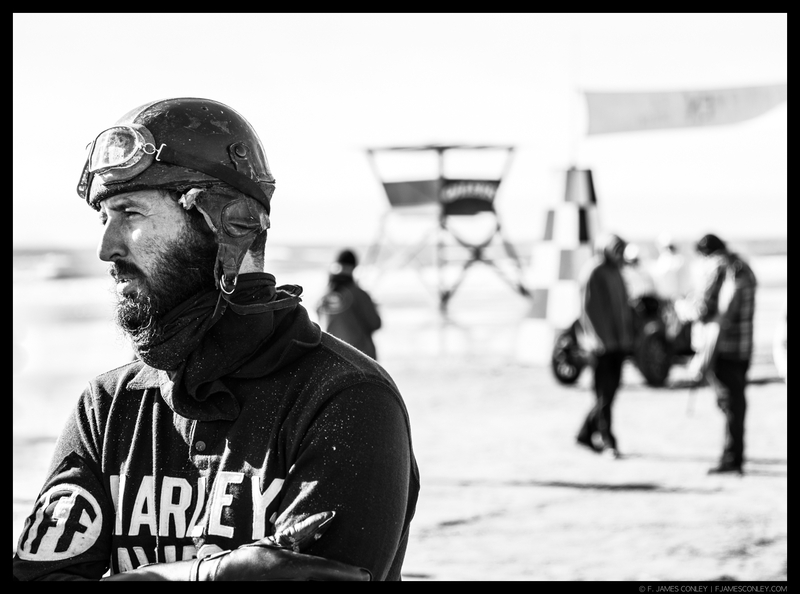 Although “motorsports” often brings to mind long lenses and monopods, my interest in the event was more about the people than the racing. Thus, my lenses were almost all wide. 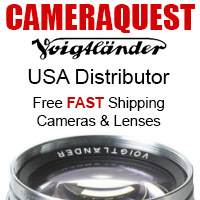 I relied heavily on an older Canon L Series 17-35mm on a 70D, with the X100s outfitted with the 50mm Teleconverter. The XE-1 had a support role with the 55-200mm. I find the Fujis easier to work with in bright light, because exposure compensation is obvious. But the speed of the Canon can’t be beat. 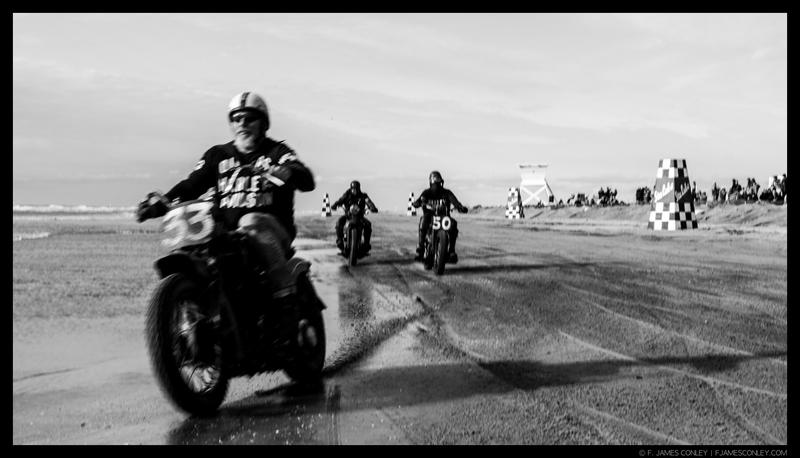 Wandering through the crowd, what at first appears to be a lawless takeover by various biker gangs is anything but. The dress code is the first clue. High, laced boots, paired with jodhpurs. Pilot and horseback riding helmets. Knit jerseys lettered with race events seven decades past. The women sport short bangs with long hair, beehives, and Rosie the Riveter styles, paired with high-waisted, pinstriped shorts. Then there are the bikes. 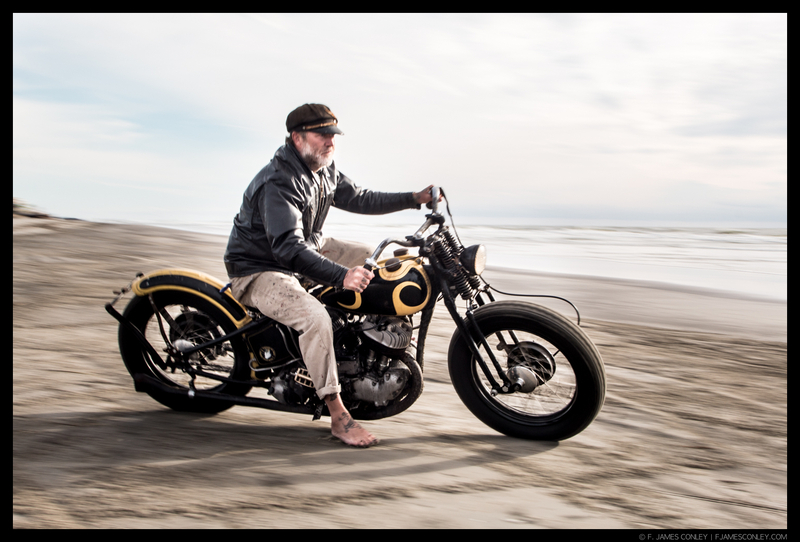 These aren’t the Harley-Davidson’s you’ve seen on television. They are long. And old. Very old. Mixed in is the occasional Henderson and a smattering of Indians, all with huge engines. The cars are likewise all American: Mercury, Buick, Pontiac, Dodge, Plymouth, Ford, and Chrysler. Model A’s, coupes, and roadsters. Each one a piece of moving history, and each one with a driver or rider whose knuckles show the years of effort it took to rebuild these machines to working order. Then there are the smiles. Broad and warm, the smiles are constant. Every face is marked with joy, even when the car won’t start, even when the bike doesn’t turn over. This gathering is, in fact, about being a gentleman. Those who build, enter, and race their machines exhibit the good, courteous, and polite conduct befitting the title. 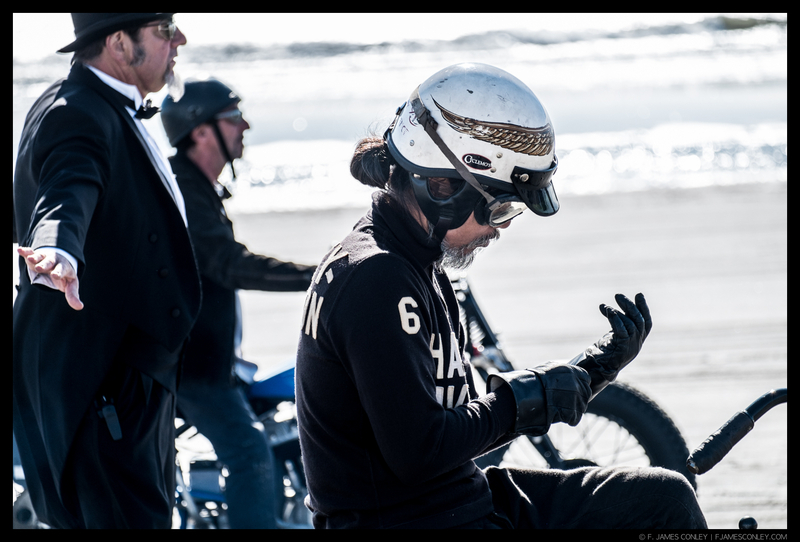 Despite the sand, the grease, the noise, the competition, and even the alcohol, each racer stays true to gentlemanly form: quick to lend a hand, always with a charming smile, undisturbed by adversity, and always stylish. 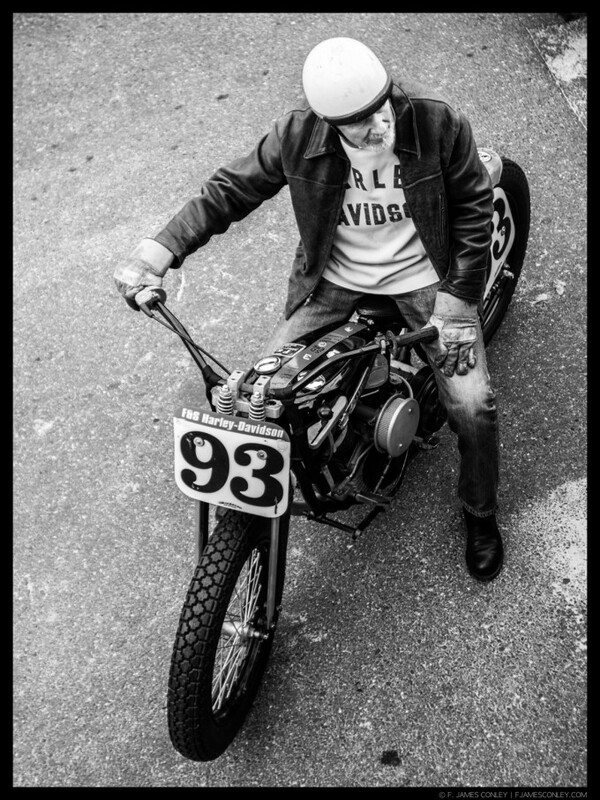 It is a set of values not of the present time, and the strict rules for entering the race make perfect sense: The Race of Gentlemen is not about racing cars and motorcycles down a beach; The Race of Gentlemen is about recapturing the American can-do spirit, the generosity, the love of life, and the camaraderie that come from choosing to be part of the human race, as a gentleman. 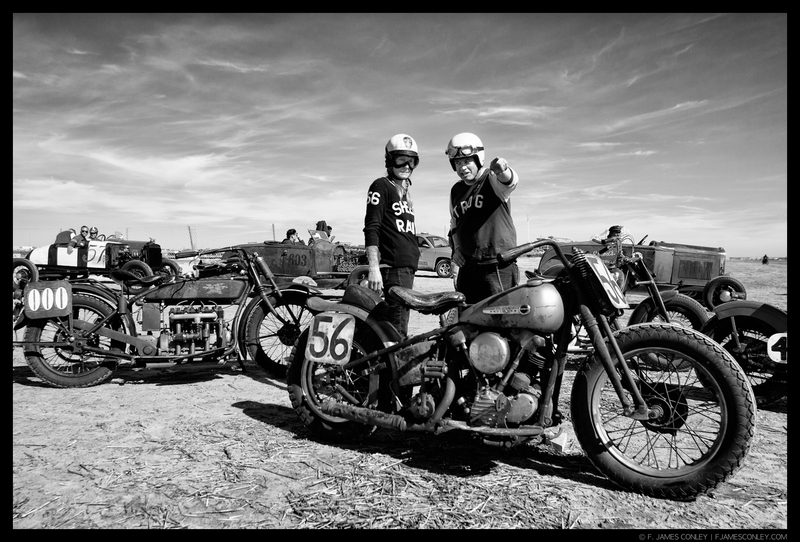 I’m happy to share with you this brief photo-essay of a day of vintage racing. The checkered flag shot is awesome! Excellent work. The flag girl shot is amazing. Thank you very much to everyone for your kind comments and observations! It’s certainly my belief that an image has no purpose until it communicates with an audience, and the positive response to this set of images and the write up is heartwarming. I very much appreciate the time and attention everyone has given to this essay! Beautiful beautiful images. Great write up. I particularly love the checquered flag shot. The composition and development of each and every one of these is just gorgeous. Thank you. Love it, did you actually race? Are you a gentleman on the day? Or were you solely a reporter? 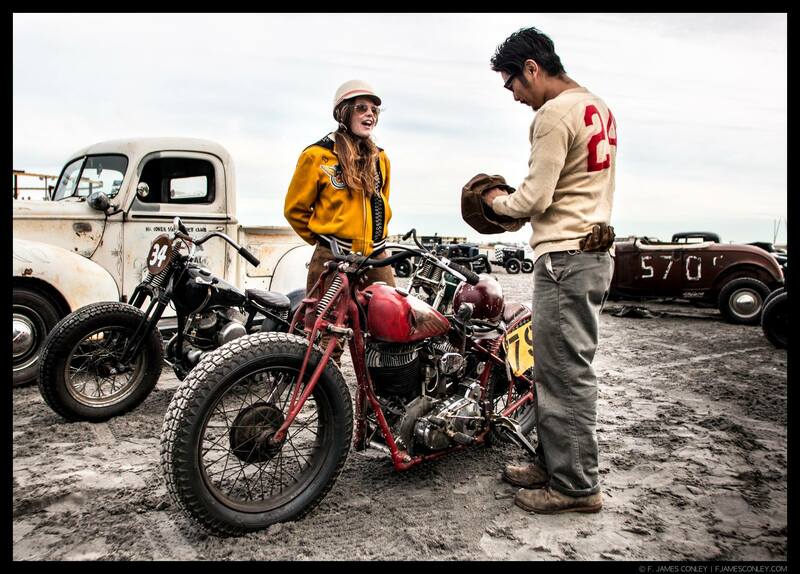 The race is limited to American made motorbikes, 1953 and older, and American cars, 1934 and older. My present bike is a 2014 Royal Enfield, so I couldn’t participate otherwise than as a journalist. 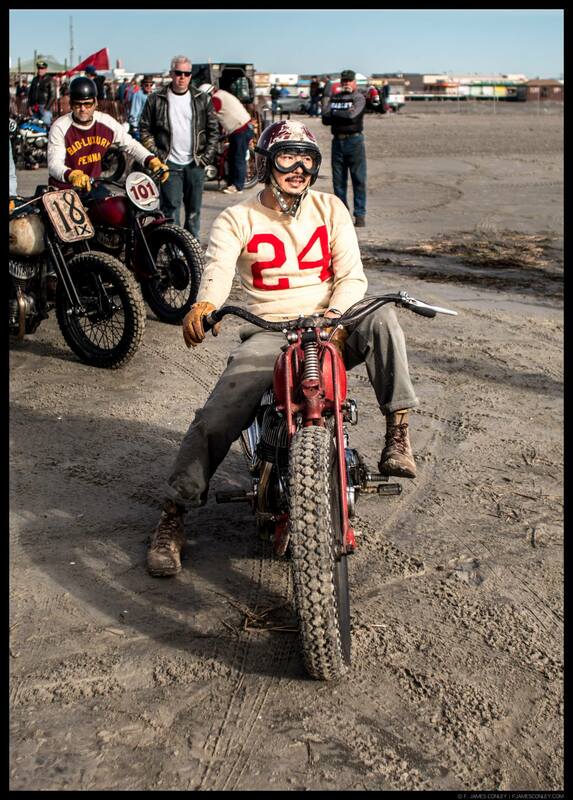 But the pure joy of the participants certainly makes me consider tracking down a bike that fits the limits! great shots, the colours provoke an atmosphere that takes one back in time. very well done and thanks for sharing. Really great pictures, and I think the pp suits perfectly. Thanks a lot for sharing. Brilliant work, and the first (for me) genuinely original subject matter. Beautifully rendered, and true to the zeitgeist of that era. Bravo. Great stuff more of these real photos with great characters not this sub average GAS hullabaloo. 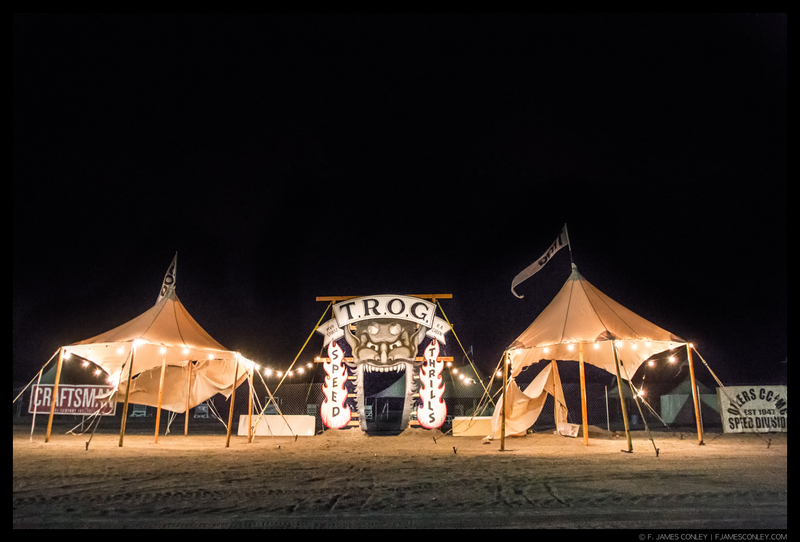 These are just great, love the atmosphere! Really well done. What a weekend it must have been! Great essay and photo story, one of the best in recent memory. Thanks for sharing with all of us. Beautiful work! I linked over to your website and read your post from Iran; excellent images and thoughtful writing. It pleases me to read of your open-minded approach to the people – not the government – of that country. A few years ago I shared a similar experience in the war-torn northern region of Iraq. 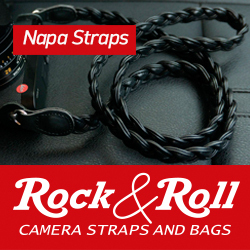 That remains one of my most positive travel experiences and photography outlets. Keep up the great work and all the best on your business’ success. Thanks so much, Leonard! Couldn’t agree with you more. Especially with very loaded subjects, it’s easy to get distracted by issues that don’t matter to capturing moments. Glad you enjoyed the images! That must have been fun to capture…. great selection James! How can I get an 8×10 of the flag girl? Send me an email from my site and I’ll be happy to discuss prints! I enjoyed the picture of the lady with the flag , Good idea !!! But in some shots didn’t like the colours, seemed faded. Fascinating photo essay, thank you! I love the second last panning shot on the beach – very atmospheric. 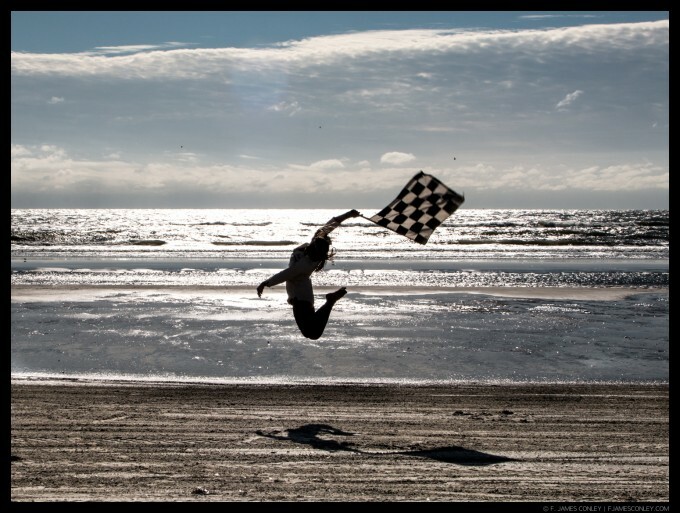 Very nice essay, and I love the checkered flag shot!